Learning how to respond to complaint letters is an art form in itself. You’ve got to be courteous, empathetic, apologetic and above all remember that the customer is always right. But some PR and Marketing companies have taken it to a whole new level, with their hilarious replies that only strengthen and grow their branding. It’s rare in today’s world to be sent a concrete letter of complaint, what’s more likely is that social media will be the platform, and you’ll be tweeted or sent a negative Facebook post. Let’s see how some of the world’s top companies respond to criticism. 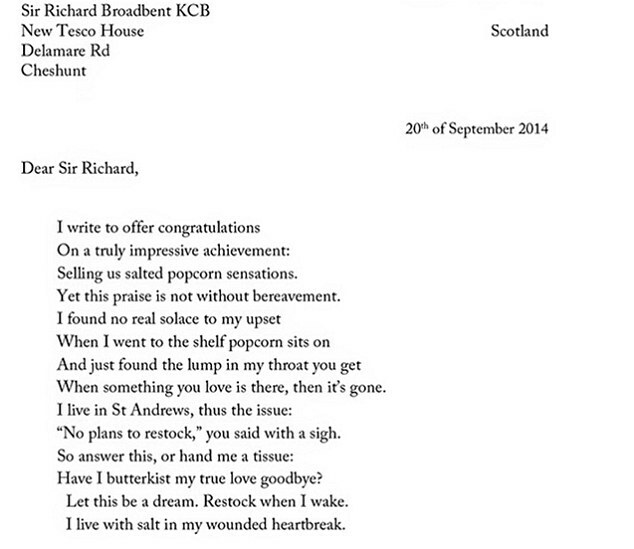 Two unhappy St. Andrews customers brought the lack of Butterkist Popcorn on their Tesco shelves to the attention of the store by sending a politely worded poem. 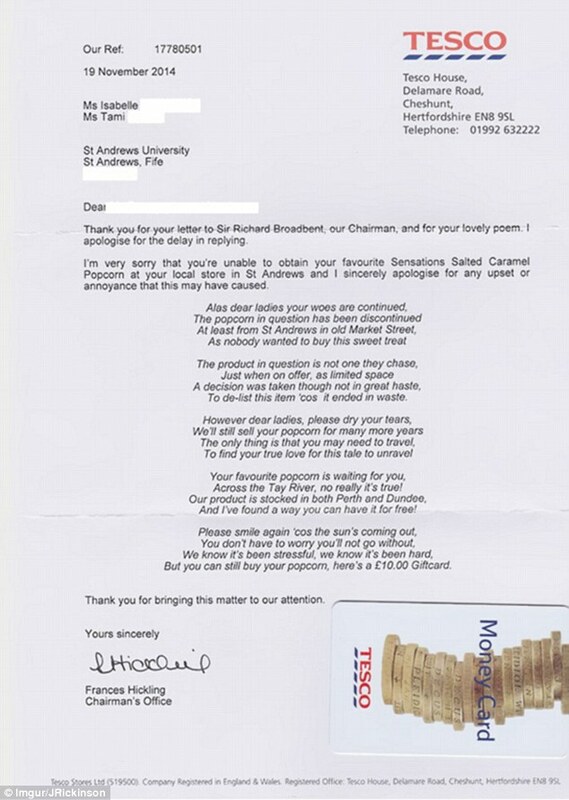 Tesco could have easily responded, saying they were sorry for the inconvenience and left it at that, but instead, they decided to write their own apology poem. In it they let the two ladies know which stores nearby will be selling their beloved popcorn, and as a gesture of goodwill, sent a £10 gift card so they could purchase some for free. Amazingly both poems were mailed in hard copy form, but they quickly went viral when the photos were posted online. Tesco handled this complaint in good humour, perhaps knowing it had the potential to go big on social. They also did everything they could to make sure these women continued to be Tesco shoppers. This tweet by Immy ‘BADMAN’ Bugti epitomises what a 21st-century complaint letter consists of. His grammar, or lack thereof, inspired Argos to use the same lingo in their reply. Not only does Argos let them know when the next available stock will be in, but they also apologise for their employee’s attitude all in a hilarious and banter-riddled way. 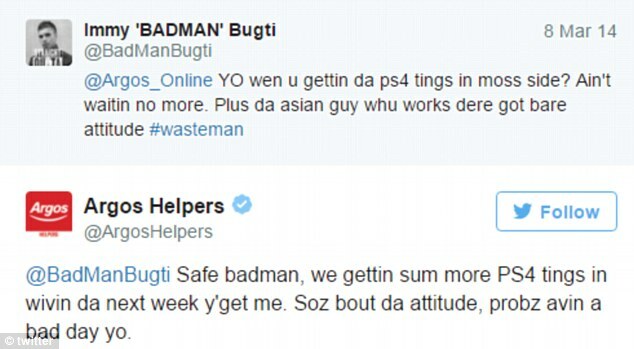 BADMAN’s response? He simply tweets back, ‘respect. Sick guy.’ Argos has kept their shopper happy and helped to boost their branding by letting other potential customers know they’ve got a fun, quirky side and are all about exceptional service. This tongue-in-cheek Facebook post unsurprisingly went viral very quickly. 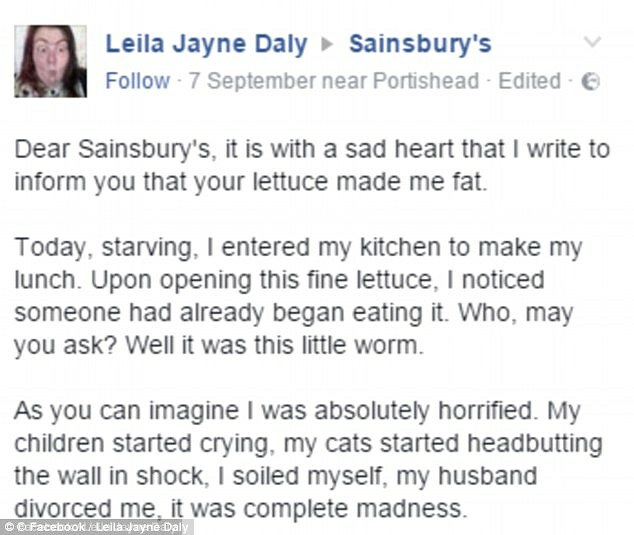 Sainsbury’s customer Leila Jayne Daly complains that she has found a worm in her salad, which caused her so much distress she instead ate a burger and quickly gained 12 stone. 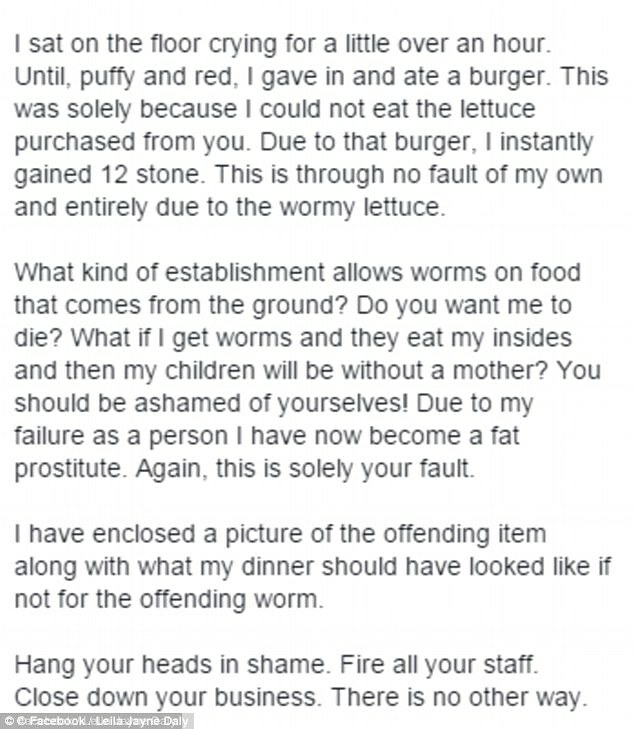 The alleged worm incident also forced her to walk the streets for money, and she wants Sainsbury’s to take responsibility for her crumbling life by closing their doors and firing all staff. Obviously poking fun at over-dramatic complaint letters, Leila makes her point while gaining the attention of thousands of Sainsbury’s facebook followers. Sainsbury’s took her complaint in their stride, replying with comments on all aspects of her woeful tale and suggest she turns to salad-making as a new career. Joking aside, Sainsbury’s stepped up to the plate and offered her a refund on her salad, as well as giving her a gift card so she can purchase a little something extra for herself. 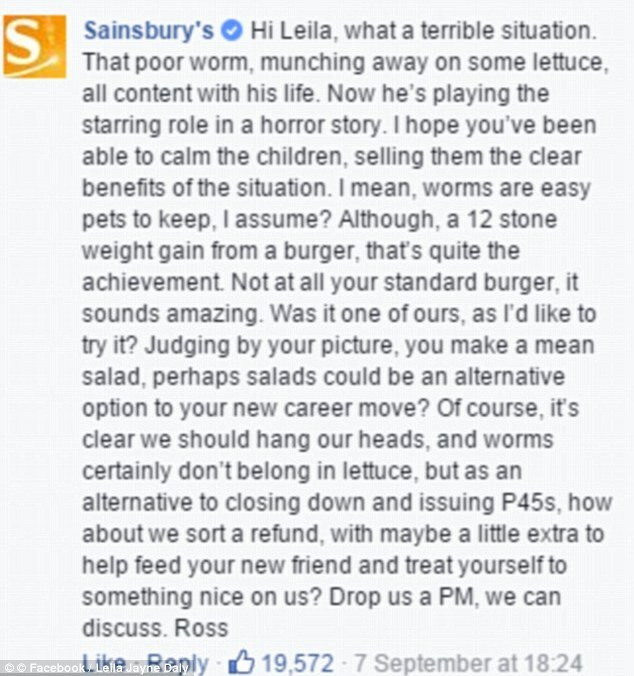 The response given by Sainsbury’s highlights how effective social media can be in marketing and PR. The company’s reply was ‘liked’ over 19,000 times and shows that Sainsbury’s can be a good sport and listen to the customer. When Esai Velez booked his four-hour flight with JetBlue he probably didn’t expect the TV not to work for the duration. Thanks to social media Velez didn’t need to send a lengthy complaint letter, instead, he simply tweeted the airline directly. JetBlue quickly responded asking for more information and then replied with empathy, and of course an offer for Velez to receive credit for his next flight with them. They had the whole issue dealt with in just 23 minutes, leading to a further tweet from Velez showing his gratitude. JetBlue’s response and customer service is the perfect example of how to reply to complaintsm while still retaining your fan base and building confidence in your brand. It also ensures that the consumer won’t be going to your competitor any time soon. It may be tempting to retaliate if you get a negative review or complaint letter, but rising above, apologising and giving a helpful response is the best way forward. Responding in a positive and non-passive-aggressive tone is key to making sure you keep your customers happy, and that they continue to support your brand. It’s also a very smart way of turning something negative into good PR and an excellent opportunity to build your brand image, all by showing how well you can respond to adversity. There will always be complaint letters, whether it’s via social media, email or direct written correspondence. But it’s the way companies reply that sets them apart in the industry and makes or breaks their customer following. Of course, it also helps if you add a little humour to your response. To find out more about how to give your digital marketing a boost, get in touch with us today. Do more words equate to better rankings?